Ahoy there, Mateys! Come aboard and take a look through my pirate telescope! We have become pirate fans this past month. There is a show on Disney Junior called Jake and the Neverland Pirates. We haven’t actually watched an entire show, but there are two pirate musicians that go by the names of Sharky and Bones who show up in animated form in each episode. Then between shows the two show up in their live-action forms, and perform an original song. This is the part we watch (or just youtube over and over again)! They have catchy little pirate-themed tunes that we like to dance and singalong to. Ironically, Sharky and Bones are played by Loren Hoskins and Kevin Hendrickson who were members of a family-oriented “pirate rock” band in Portland, Oregon. We LIVE in Portland, Oregon!!!! Why am I just now discovering these guys? I wish I would have known about them before they became big Disney stars and were performing their local concerts. ARGGGGHHH!! So my boys have pirate hats that I found at Target for $2 each. And then when I was looking at my leftover pool noodle pieces from my latest craft project (pool noodle tic tac toe), I thought, hey, these would make great telescopes! They are super simple to make and so much fun to role play with! 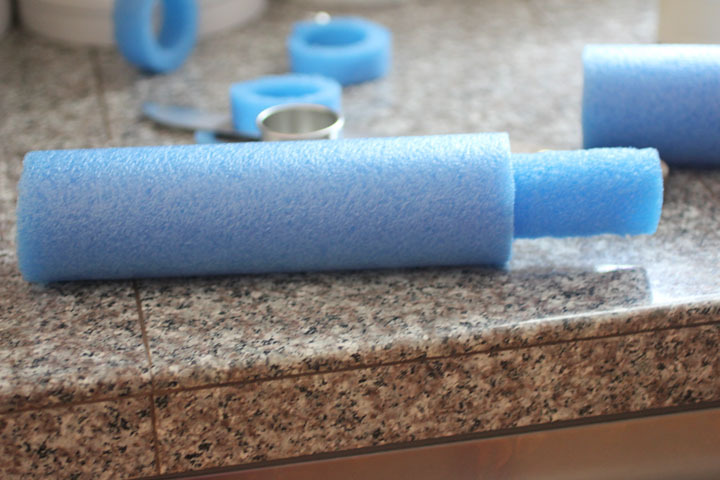 I mentioned before, that pool noodles cut like butter. So I took a 12″ piece of pool noodle (you can buy these at the Dollar Store) and a 2″ round cookie cutter, and twisted the cookie cutter into one end of the noodle. When it couldn’t go any father, I used a bread knife to cut the outside part of the noodle off. Make sure you cut it where the cookie cutter sits. 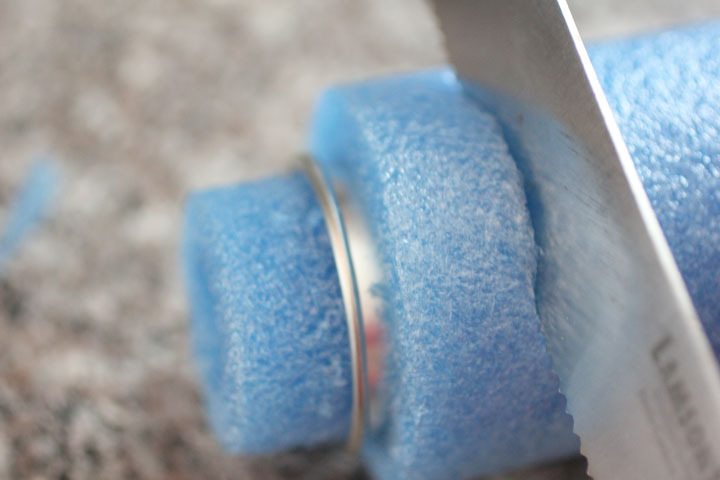 The cookie cutter will stop the knife from cutting any deeper than needed. 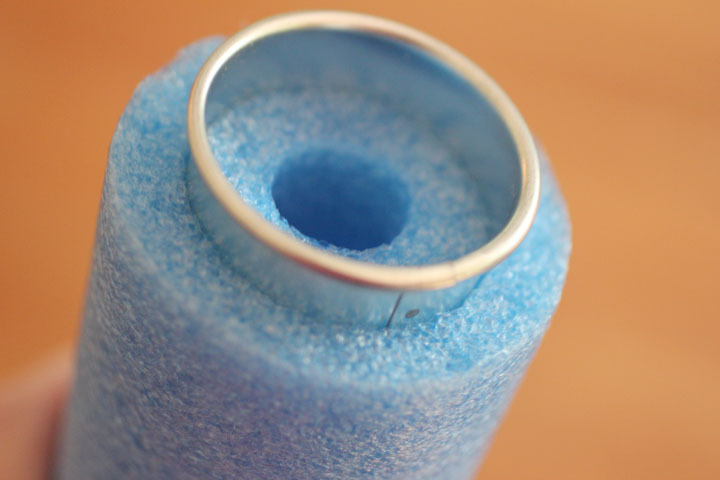 I kept twisting and cutting until I had about a 3″ inches of skinny noodle sticking out. At this point you pretty much have your telescope! Easy, right? 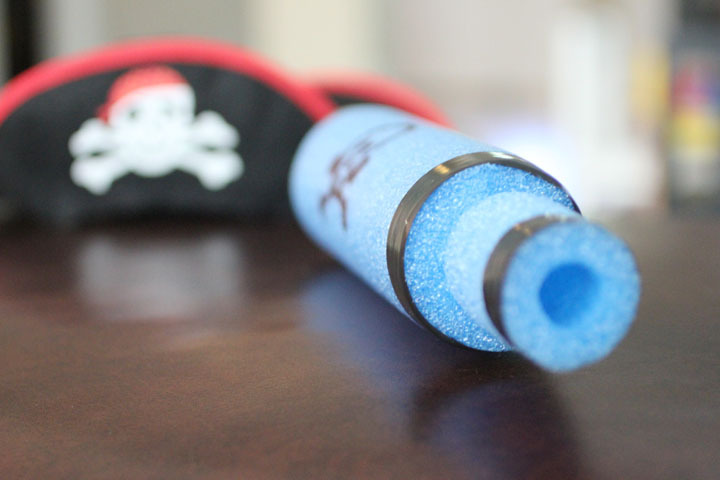 I decorated mine with black electrical tape around the ends and used a sharpie to draw on a skull and bones. If you want, you can do a reverse cut on the other end. Twist your cookie cutter in, but instead of cutting the outside of the noodle, cut along the inside. This proved difficult and unnecessary. But have at it if you’d like :o) Here is what the other end looks like. Now all hands on deck! 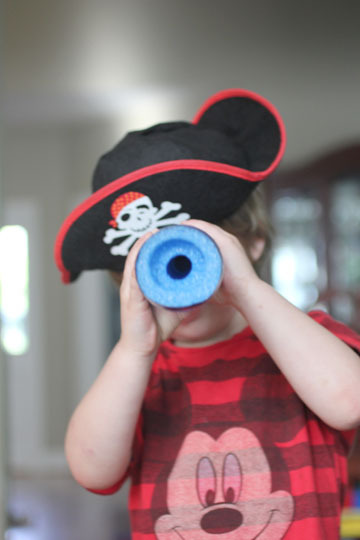 Grab a noodle and make your own pirate telescope! 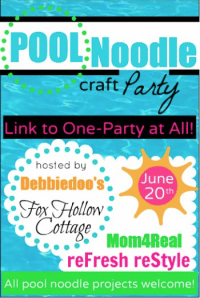 Linking up to the Pool Noodle Craft Party! Oh what a cutie, and what a cute idea. Glad you linked up to the pool noodle party. Do you mind adding our link so others can find the party too. It has been fun seeing all the unique uses of a noodle. Thanks for the reminder Debbie! I had the link on my Tic Tac Toe post, but forgot to add it to this one. Done and Done! So creative! My little guy would love this! If you have a moment I'd love your vote in Circle of Moms Top 25 Homeschooling blogs (http://www.circleofmoms.com/top25/Top-25-Homeschooling-Moms-2012) – Thanks!! Great idea! 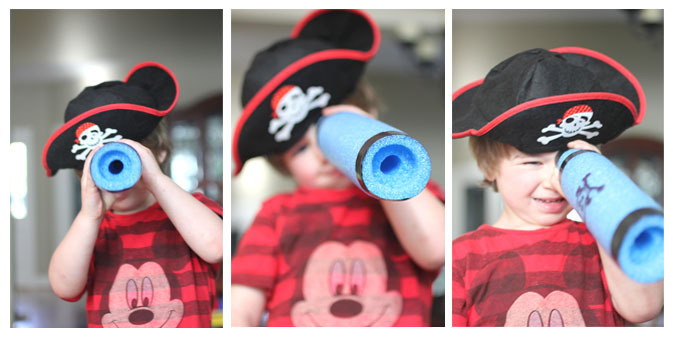 I have some little pirate lovers at my house that would love a telescope! So cool! 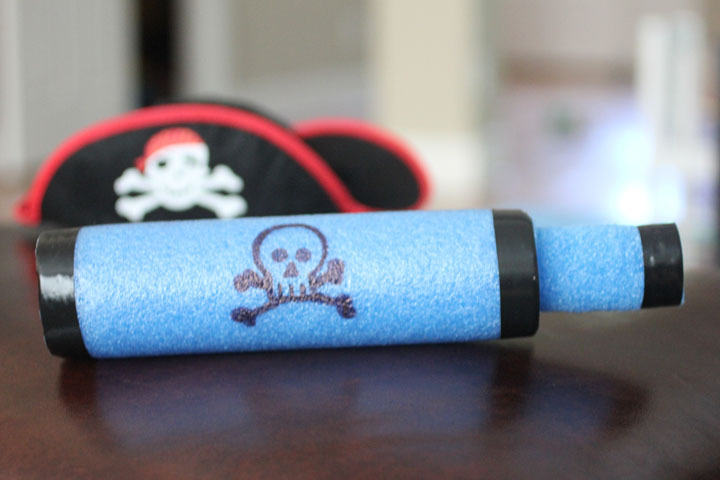 I know many little pirates who will love this idea. Thanks for sharing. My grandsons would love this! Thanks for sharing at our linky party! Oh my- these are PERFECT!!! You are So Good girl!! Love this idea! Om my goodness. My boys are going to love me a million times more when I make these spyglasses! I love having you at Wednesday Whatsits and all the cool stuff you share each week. I'm giving you the versatile blogger award.